We have all been there, every 3-5 years we hear “The site needs a refresh, a redesign – something!”. You go off, you get a designer to come up with some fantastic new looks, shiny new buttons, fancy form animation. Everyone around you agrees, it looks fantastic – let’s do it! Roll forward and the site is launched, the first analytics data starts to come through and……..the key metrics are down. What has caused it? Is it just a “settling in period”? Is something broken? Is it the redesign? That’s when the problems inherent in a site redesign become apparent. So what can we do to make sure we don’t make the same mistakes? For Kraken Data, we make sure we really get to know your company, your customers and your website. We use existing data and implement other initiatives to identify where your site is working well. If you don’t carry forward the site features that currently work well you are basically throwing money down the drain and given that many sites opt for a redesign every 3-4 years, that’s a lot of potential for feature/revenue loss. Consider the benefits of incremental change, particularly change based on solid data. 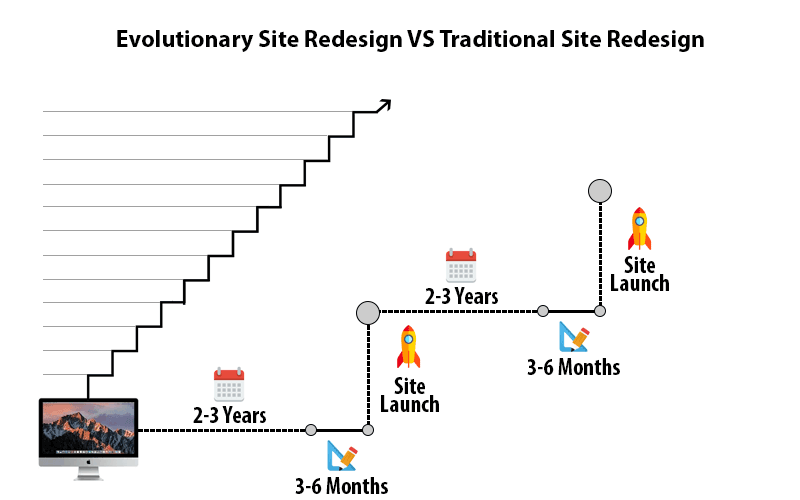 A major redesign can take months, the design, development and testing all add to a major drain on resources and money – all without the certainty of a good return on investment. By moving to an incremental change program you free up resources for other projects to move the business forward. Backing these changes up with CRO testing also gives confidence about the benefits of those changes and the probable outcomes to be expected. Big changes in site look, feel and functionality can create uncertainty and friction in your existing user base. We tend to dislike change when we come to undertaking regular purchasing patterns. Why has that button moved? Why is the menu in a different place? Why are the colours different? Is this the right site?? When performing incremental change based on observed user behaviour (as a result of CRO testing), you know the effects beforehand. When you undertake a major redesign you can change traffic flows, essential touch points and user interactions. That makes it extremely difficult to identify causes for site performance dips (or lifts) and where the changes occured. Incremental change allows for easier comparison of data pre and post change, meaning you can move quickly if any sudden changes in performance occur. Your own teams will have far greater confidence in coming up with ideas and theories that they think will lead to improvements in user experience and ultimately your online web performance. They will start to better understand the implications and effort involved by using methodologies like ICE. Impact: What sort of impact do I expect as a result of this test?? Confidence: How sure am I that this test will prove my hypothesis? Ease: How much effort will it take to launch this test? And if the hypothesis shows a loss? Then that is still a valuable learning, remember to fail small and fast! We find that the main drawback in incremental testing is obtaining significant results. Kraken Data generally sees about a 50% success rate with A/B tests that are clear winners, so test throughput is important in identifying potential site improvements. Our programs are designed to facilitate smooth conversion rate optimisation programs that gather pace and complexity as they progress. Most businesses underestimate the skill and experience required to run a CRO program correctly. A complete site redesign will always need a diverse and deep knowledge of a number of skills, but if you don’t understand A/B testing, you will find it as complicated as the redesign. We have run thousands of tests and can differentiate between good tests and ones that are likely to have little reward for effort. If you would like to hear more or want to chat about how we can help you on the optimisation journey, please contact us on 1300 615 388 or use the form below. We love talking about optimisation!